Why No "Respect for People?" Why are so few organizations competent when it comes to the “Respect for People” principle? Let’s consider this question from the perspective of how organizations are designed. Nearly all organizations exist as a hierarchy, in the model of a military hierarchy. The CEO or president is at the top and the worker is at the bottom. Implicit in this organizational design is the belief that those at the top are smarter and better than those at the bottom. People at the top believe this, and so too do many people at the bottom. To a great extent, it’s just human nature to want to believe those above you in a hierarchy are smarter and better. If left untested (unquestioned), these beliefs and assumptions lead to a natural outcome among the leaders: “Do as I say because I am the boss and I know better than you.” This, along with blaming people for errors, are the quintessential forms of disrespect for people which, of course, start at the top. If, instead, beliefs and assumptions are tested, such as via kaizen (a derivative of the scientific method), then one realizes that people at all levels are intelligent and have different skills and capabilities to offer. And, the combination of skills and capabilities results in many things that are valuable: ideas, creativity, innovation, information flow, problem avoidance, problem-solving, etc. Amazing things happen when people can freely interact with and speak to one another up-and-down and across the organization. 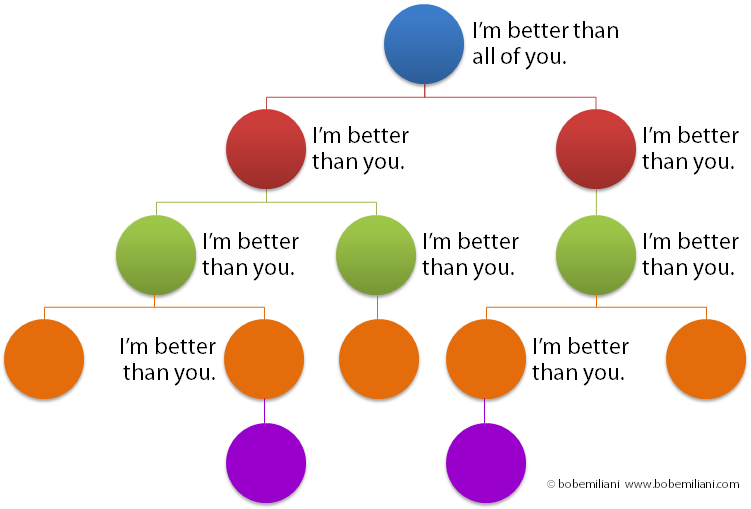 Hierarchies may be unavoidable in most cases, but the “I’m better than you” trap that leaders fall victim to, whether self-imposed or the view of others, is avoidable. If they can do that, then continuous improvement comes alive with the entire enterprise, top-to-bottom, with the spin-off benefit of reducing people’s stress and creating a healthier work environment both mentally and physically. It’s very a nice post, to think at all levels the presumption that each of us has. Great post. The “I’m better than you” trap is a great way of describing the problem. This is pretty insidious in healthcare organizations and it really interferes with quality, patient safety, and any semblance of improvement. Leaders need to “get over themselves” sometimes. Yes, they have a critically important role to play, but one can be a more effective leader by giving up the “I’m better than you” attitude. Everybody wins as a result. I completely agree on this, human should respect each other and share there knowledge instead of doing ordering or getting influence from others in a negative manner this will discourage the team members to perform well.